How can real estate make the most of the PropTech revolution? The British Property Federation report aims to understand the barriers to and opportunities for improving the productivity of the real estate sector through the application of property technology (PropTech). The report published highlights that while 50 per cent of PropTech companies focus on sales/leasing, only 16 and 12 per cent respectively apply themselves in construction and investment/financing respectively. Land acquisition and refurbishment have less than five per cent of active PropTech companies. No companies, from the data sources used for the report, fell into the category for demolition/remediation. - Improve market information: there is a dearth of clear, quantitative and authoritative information, from the needs of different users across the property lifecycle to the nature and type of technologies on offer to property professionals. It means that investment, buying and selling decisions are not optimised. - Embed digital knowledge and foster innovative behaviours: the research uncovered scarce and unevenly distributed technical digital skills and a lack of business innovation mindset across the property sector. 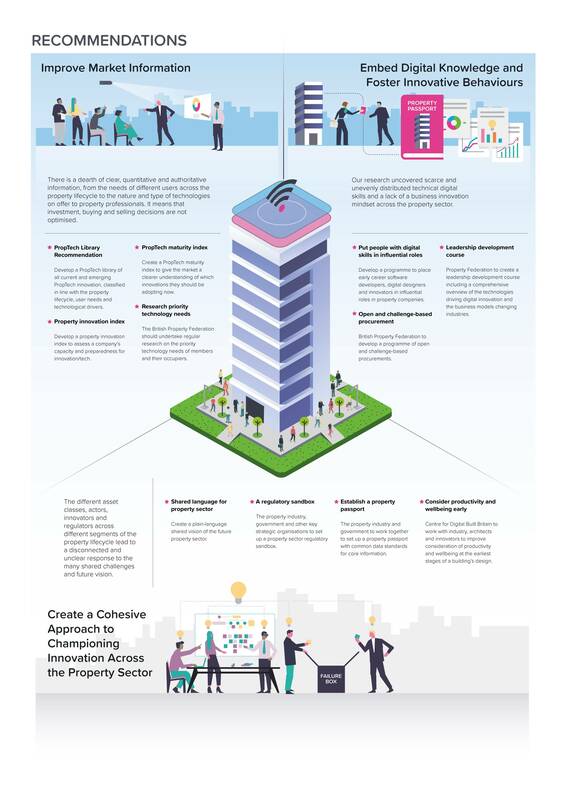 - Create a cohesive approach to championing innovation across the commercial property sector: the different asset classes, actors, innovators and regulators across different segments of the property lifecycle lead to a disconnected and unclear response to the many shared challenges and future vision.